For the first time in more than 50 years, a party other than the Liberals or Parti Quebecois will hold the power in Quebec City. But what will voters get in François Legault’s Coalition Avenir Québec? What will voters get in François Legault’s Coalition Avenir Québec? For the first time in more than 50 years, a party other than the Liberals or Parti Québécois will be in power in Quebec City. What should Quebecers expect of François Legault's Coalition Avenir Québec, who won a majority in Monday's election? Here are some of the party's key priorities — and others it's left on the backburner. The CAQ favours the decentralization of the health-care system and would allow the private-sector to supply more services. It has promised to renegotiate a controversial compensation package with Quebec's medical specialists. The savings, however, are not included in the party's financial plan, indicating they aren't counting on striking a new deal. They want to overhaul the province's long-term institutional care system (CHSLDs) with a new network of what they say would be smaller, more "humane" homes, at an initial cost of $1 billion. The CAQ is promising to put $1.7 billion back into the wallets of Quebecers annually, primarily through allocations to families and a reduction in school taxes. Legault has promised to give families $2,400 per child annually. Right now, families receive that amount only for their first child. Legault has vowed to cut the number of immigrants by 20 per cent, to 40,000 annually. Under the CAQ plan, newcomers will have to pass a language and values test in order to get a Quebec selection certificate — a requirement to stay. Legault says the change would ensure more immigrants integrate into the workforce. 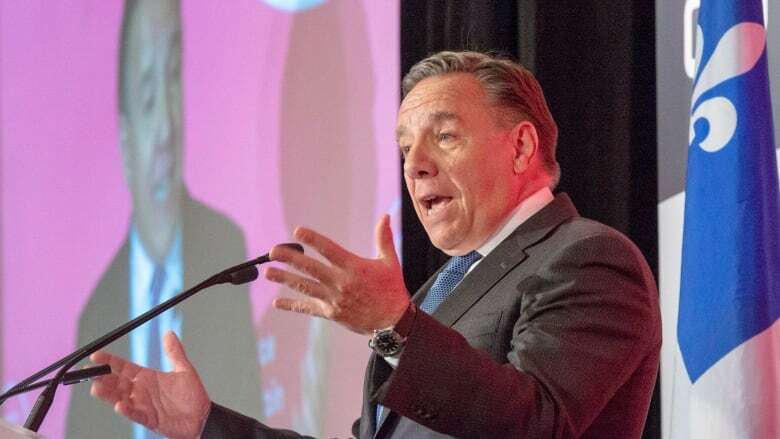 During the campaign, Legault struggled to explain the details of his plan — and the basics of Canada's immigration policy. Quebec only has jurisdiction over economic immigrants, so Legault will need to work with Ottawa if he wants to reduce the intake of refugees, as well as the number of immigrants who come to Quebec through Canada's family reunification program. Those two categories account for roughly 20 per cent of new arrivals. Legault wants to create government-funded pre-kindergarten across Quebec. Sending all those four-year-olds to school a year earlier will open up 50,000 spots in the public daycare system within five years, he said. The policy could come into effect as early as 2019. Critics question the CAQ's $311 million annual price tag for the program and whether it's achievable, given the shortage of space in many schools. Legault wants to abolish school boards and replace them with "service centres" that would provide administrative support to schools. The party believes this would give schools greater autonomy and make the education system cheaper to run. Anglophone groups have vowed to fight the change in court, arguing it would infringe on their constitutionally protected rights. The CAQ says it would pass a secular charter that would go further than the Liberals' religious neutrality law, portions of which are subject to a constitutional challenge. The CAQ opposes the wearing of religious symbols, including the hijab, by police officers and others who wield coercive state power. The party would also ban school teachers from wearing religious symbols. Legault said he supports international greenhouse gas reduction targets but has not been clear on how the CAQ would achieve that. The party opposes the elimination of fossil fuel subsidies and the ban on the construction of new oil and gas infrastructure. The CAQ's environmental policies ranked lowest among the four main parties in a recent survey by environment groups. Priorities for the CAQ's voting base in the suburbs include extending greater Montreal's light-rail transit (REM) line to Chambly on the South Shore and to Laval, north of Montreal — a plan that environmentalists worry would encourage further sprawl. The party would also extend Highway 19 in Laval and provide tax breaks for carpooling. Legault opposes Plante's proposal for a new Pink Metro line, which would run from northeast Montreal to the southwest.